For 2018, there have been upgrades to the CrossMgr/Impinj RFID timing system that provide improved quality results. April 2018: CrossMgrImpinj software was upgraded to support quadratic regression (QR) analysis. This allows CrossMgr software to use 3 or more RFID chip times to calculate the time on the finish line with 1/100 second precision, yielding 6-inch accuracy at 34mph. 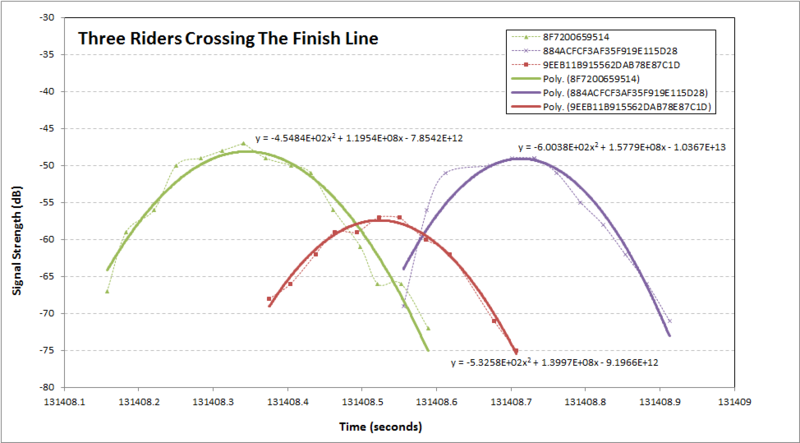 Prior to quadratic regression, CrossMgr used only the first time reported by an Impinj reader, resulting in finish times up to 10 feet before the finish line. Since Impinj RFID readers support up to 600 tags per second, individual tags can be read up to 20 times while passing the antenna, providing plenty of data to calculate a high precision time with very high confidence. May 2018: RANSAC (random sample consensus) processing logic was added to improve the results of quadratic regression analysis. RANSAC analysis eliminates spurious outlier data collected from the RFID chip reader due to signal reflection. June 2018: Support has been added for higher resolution cameras. CrossMgrVideo software has been improved with more features for recording and reviewing finish line photos. March 2018: We’ve added an ultra low light camera with an AR0130 sensor. This camera is so sensitive to light that it is used for photographing distant stars at night. July 2018: In addition to the Impinj H47 tags that use the Impinj Monza 4 RFID chip and True3D dual dipole antenna, we also have more sensitive Smartrac Dogbone tags using the higher performance Impinj Monza R6 chips. These chips provide improved performance when wet and also when moving above 30mph. Comparison of RFID chip signal strength (RSSI) data points along with curves generated by quadratic regression from the same data.